SSM Health St. Mary’s Hospital – Jefferson City currently has an exciting opportunity available for a board-certified/eligible outpatient-only internal medicine physician. This established clinic, which currently has three full-time providers, is expanding due to growth in the community. This is a full-time position with an optional four-day workweek. An established patient panel awaits. Average between 18-25 patients daily depending on complexity and your professional interests. This clinic is part of a network of seven primary care and pediatric clinics on the Epic electronic medical record system and connected with St. Mary's Hospital - Jefferson City, which relocated to a new state-of-the-art facility in November 2014. St. Mary's has been part of the community for more than 110 years and is a member of SSM Health, a faith-based health care system operating 20 hospitals in Wisconsin, Illinois, Missouri and Oklahoma. Jefferson City (population 45,000) offers excellent schools, ample housing options and a very stable economy. It is a wonderful place to raise a family. Jefferson City is a safe and friendly community with a diverse employer base, low cost of living, and brief commute times. It is conveniently located just 30 minutes from Columbia and the University of Missouri, 45 minutes from the beautiful Lake of the Ozarks, and 2 hours from both St. Louis and Kansas City. Jefferson City was recently named the “Most Beautiful Small Town in America” by Rand McNally. St. Mary’s Hospital - Jefferson City is a 167-bed, full-service community hospital located in Missouri’s state capital. The hospital features a dedicated inpatient pediatric unit, a Wound Center and Outpatient Treatment Center. Other services offered at the hospital include emergency services, cardiology, orthopedic care, cancer care, outpatient surgical services, maternity care and women’s health. The hospital moved to a new, state-of-the-art building in November 2014. Please visit our website to learn more about the patient-centered design and features of the new facility. Jefferson City (population 45,000) is a beautiful, family-friendly community situated in the heart of Missouri. It offers convenient and easy access to all three major metropolitan areas across the state. Located just 45 minutes from the beautiful Lake of the Ozarks, Missouri's largest lake destination. Whether it's fishing, boating, skiing, shopping, dining, or simply relaxing, the Lake of the Ozarks is the premier place for family fun! SSM Health provides a full range of health services in the Mid-Missouri region. Our Mid-Missouri corridor of care includes 20+ medical group offices, community hospitals in Jefferson City, Mexico and Maryville Missouri, along with two urgent care centers. SSM Health Medical Group offices provide family practice, pediatric and specialty care services in the communities along the Interstate 54 corridor. 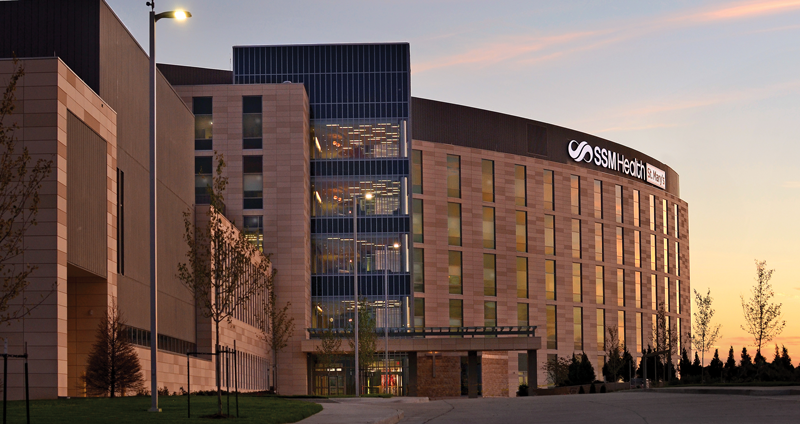 SSM Health provides sophisticated medical care close to home.